And that's today. It's been a very chill day and I'm really liking it. I got to sleep in which was very nice. Then I took a cold shower because the pilot was put out by the rain last night. I talked to family which was very fun. Decorated and watered our Christmas tree. Made some rice. Did my Spanish homework. And that brings me here. And it's beautiful outside. We've had a lot of rain over the past couple nights but the days are gorgeous. 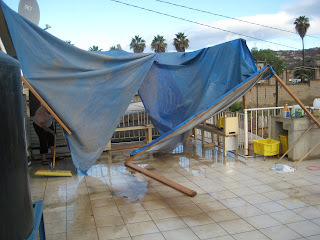 We woke up yesterday to find a bit of a disaster on our patio because of the rain. There was a makeshift shade thing the pastors built and gave out under the weight of all the rain gathering in the tarps. In just a few minutes we're going over to Rick and Tammie's to peel potatoes for dinner tonight. We're having the classic Thanksgiving meal plus the tamales Laura's family (my Spanish teacher) is bringing. I hope all of you have a fabulous Thanksgiving. I send all my love! This past weekend was eventful as every day is here. 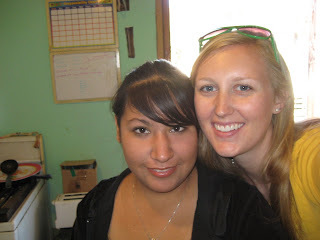 On Saturday, Casey, Kourtney and I went to have a late breakfast with my Spanish teacher, Laura. She is such a sweet lady who loves to talk and laugh and get to know people and she tells it how it is. We had pancakes, yogurt, eggs, bacon, tamales, juice and coffee. Much like the States. Except the tamales. We ended up staying about three and a half hours just because we were having such a good time. 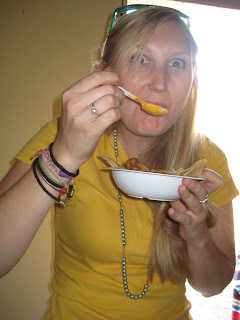 Laura and her family are also going to have Thanksgiving with us at Rick and Tammie's house. Please pray that we will show the love and grace of Christ to her. 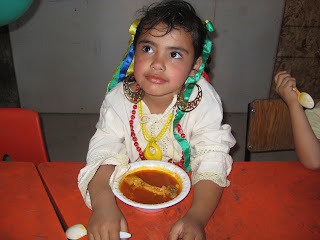 She grew up in the Catholic church here in Mexico but was disenchanted with the legalism and was very hurt. This relationship God has developed between Laura and her family and Rick and Tammie and us interns is really neat and exciting. After breakfast we went to Walmart to buy a gift for a baby shower. Saturday night we hosted a baby shower here at the Second Floor for Mary (Francisco's wife). Rossy and Mini (a woman from Mary's church) decorated the Second Floor with balloons and table cloths and baby shower signs and it looked really nice. The down side was that not many people showed up. But we still had a lot of fun and blessed Mary and her baby on the way. It's a boy and his name is going to be Francisco. Just like his daddy. Sunday was church, of course. Rossy asked if I would take the little kids (ages 2 and 3) while she took the big ones. There were five of them and we went in the downstairs of the church. We colored and played with toy instruments and I read them a story and sang a song. Kourtney said they could here me talking upstairs. I hope they didn't hear me singing! I had a fun with them. And I would write more but I have to go to class in 25 minutes and just realized I didn't do my homework!!! Today was another interesting day in Mexico. We woke up to another day of no water. I didn't take a shower yesterday or the day before so I decided that this was not going to happen again. I needed a shower. So we went to Agua Caliente (a name of one of the beaches) because I knew there was a campground there that would let us use their showers. But there's a catch. It's saltwater. And it's a little chilly. But I am now clean. On the way home we ran into a slight problem. There was a parade blocking about a mile of the highway live on and that we need to take to get home. 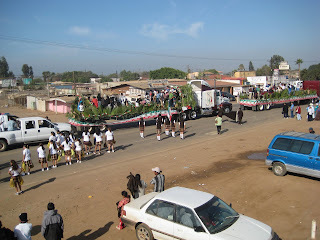 It was a huge parade for the Mexican Independence Day. There were thousands of people in the street. 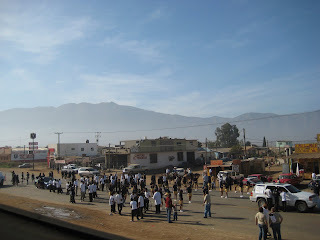 Cheerleaders, gymnasts, old ladies tossing around a volleyball, a drumline, 20 or 30 NICE classic cars and trucks, children dressed in Mexican "revolutionary" clothing, semi-trucks full of high school kids and live bands, horses, and so much more. We saw less than half of the parade go by. Before the parade started we were just walking down the street and looking at everyone in the street waiting to start. At one point, Kourtney said, "I think we're drawing more attention than the parade." We get a lot of funny looks around here and that's not going to change. But I find it pretty funny sometimes. 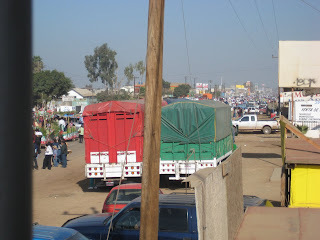 Below are some pictures of the parade from our balcony. It started right outside the Second Floor. 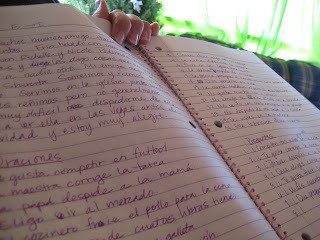 After the saltwater showers and the Mexican parade, I spent the rest of my day doing my Spanish homework. I have so much more to learn. Slow and steady wins the race! 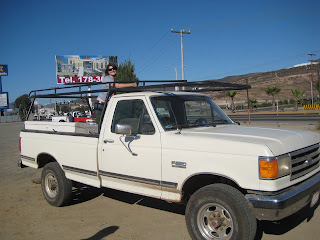 Driving a big old construction truck with children riding on the hood, roof, bed and trailor screaming "Viva Mexico!" I want to explain a little more about number 5. 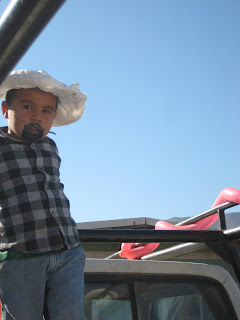 Yesterday and today are the days they celbrate Mexican Independence. I thought it was sometime in September but they have so much pride here they have multiple independence days! I think this one is just celebrating a different battle. 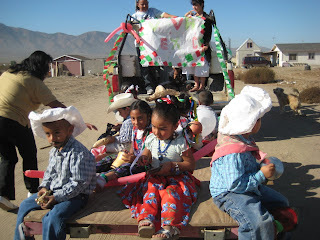 Anyways, we gussied up the truck with balloons and streamers and hauled children around Durango (the neighborhood of Roca Fuerte which is where I serve). 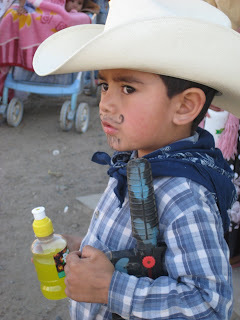 The kids dressed up like revolutionaries back in the day with their sombreros, mustaches, guns, flowing skirts, fancy hair and all. I have to tell you I was very, very nervous to have children riding all over this car that I was driving and responsible for. But all went well. Halfway through the neighborhood the horn gives out. I scream to Rossy, "El horno esta roto!". Only to realize in my Spanish class today that I was saying the oven is broken not the horn is broken. No wonder Rossy and Perla looked at me funny! From that point on Perla and I just made beeping/screaming noises to draw all the attention. 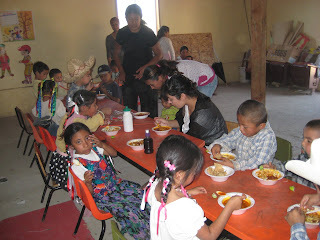 Rossy made pozole (a Mexican soup with corn, onion, lettuce an chicken) for everyone to eat after. Once again, I ask that you keep praying for me. I know your prayers are strengthening me and giving me wisdom in new situations each day. Pray for my continued growth in Spanish. 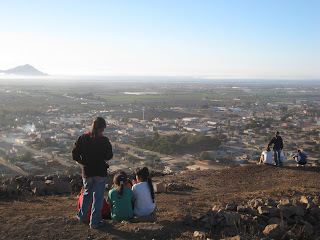 Pray that I can begin to build solid and meaningful relationships in Roca Fuerte. That I would be BOLD to step out and use the little Spanish I know to meet people and get to know them and their families. Pray for health. We've had a few people sick these last few days and it really wears on your ability to function and do ministry. I like pictures and I know you do too. 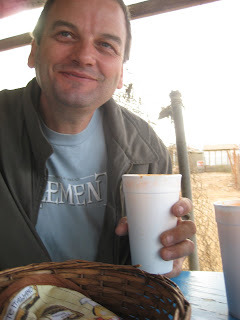 So I wanted to post a few of when my dad was here. If you don't know he did the coolest thing of taking time off work to drive me all the way down to Ensenada and hung out for a couple days. The first picture is in the car in Mexico. The drive to Ensenada follows the coast all the way down and it's beautiful. We drove my dad's 1966 Skylark down there and it was great weather. A little cold at times but great. 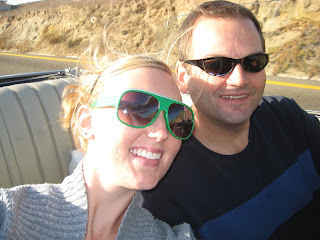 We got into Ensenada last Monday at about 4pm west coast time. The next picture was taken on the way to dinner that night. We went to the best taco stand in Meneadero...Poblano's. 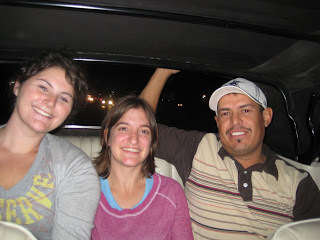 The picture is of Kourtney, Casey, and Rafa who rode in the back seat on the way to dinner. The Skylark wasn't too happy with the extra weight in the back and bottomed out a couple times but we made it. The last picture was taken at breakfast the next day. We went to this cuagmante (I think that's how it's spelled) stand right down the road from our apartment. Cuagmante is a seafood soup they eat for breakfast here. It has shrimp and octopus and other seafood. It tastes really good but there are a few things you have to close your eyes for before you eat them. The soup comes in a big, white styrofoam cup and with tortillas. Tonight, I'm going to a prayer service at Roca Fuerte. I'll be working with this church very closely for the next year. Each of us interns were assigned a different church to do ministry with. I'm so excited to be working with Ricardo and Rossy. I'll go to service at Roca Fuerte three times a week usually. Sunday morning for church. Wednesday evening for midweek church. And Friday evening for prayer service. After the prayer service tonight we are having a surprise birthday party for Perla. Rossy's little sister. She's turning 16. Kourtney and I made a cake for her this morning for her mordida! They're going to have a fire outside of their house and music and it should be lots and lots of fun. I'll try to take some pictures to show you guys. Please continue praying for me. Please pray for me as I begin doing deeper ministry with Iglesia Roca Fuerte. That I can build deep relationships with people in the church. 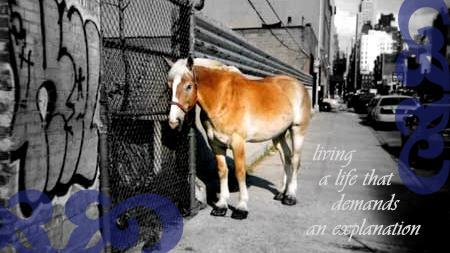 And that I would have the wisdom in where to step in and help. I'm not here to save the church or lead any ministries for them. I'm solely a support to provide them with resources and ideas and help raise up leaders and encourage people in the church to take become involved and take ownership of ministries in their church. Also, please pray that my spanish would improve more and more every day! Don't get used to me posting so often. I'm just doing it as often as I can and when I actually have stuff to share. So I just downloaded Skype. If you have Skype, hit me up. My Skype name is roney.sarah. If you don't know, Skype is a program you can download for free online to make calls using your Internet. Calls are free from Skype to Skype and a couple cents a minute to call landlines or cell phones. This is what I'll mostly be using to talk to all you guys. Leave a comment or email me (skaroney@hotmail.com) your Skype names so we can chat it up. I have my first Spanish tutoring in just an hour! I want to get this language so bad!!!! This has been a great weekend. It's been really fun to get my feet wet with groups again and slide back into it all. 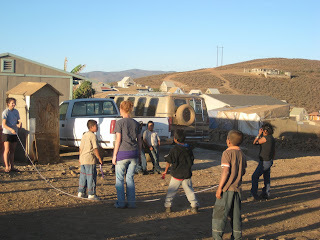 After the distribution and dinner on Saturday, we went to a soccer game between two of the churches. Iglesia Roca Fuerte beat Iglesia Rosa de Saron. Sunday we went to church at Rosa de Saron (Pastor Reynario) in the morning and Aposento Alto (Pastor Francisco) in the evening. Today, we hemmed up curtains for the apartments, went shopping in downtown Ensenada and had a final dinner and debrief together at Rick and Tammie's. The whole weekend was very fun. But I am very happy we don't have another group coming tomorrow as this group leave like we do in the summer. We have a break of about two weeks, I think. I start Spanish classes tomorrow with Tammie. 2:00pm. I'm very excited. I want to get this language so bad. Please pray for me in that. Also, please pray for my family. For God's direction and blessing and mercy. It's hard to be away when crazy things happen but I know He is in control. So I'm here. It almost feels like I never left. I've had so many warm welcome backs. It's so good. My roommates for the next year are Casey and Kourtney. Casey if from a small town in NY and Kourtney is from New Jersey. Not a small town but definitely smaller than Vegas! 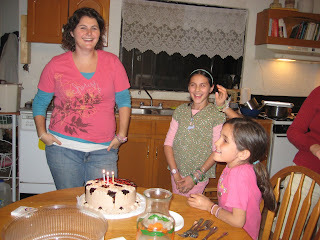 Kourtney's birthday was a couple days ago and here are some pictures of her mordida at Rick and Tammie's. 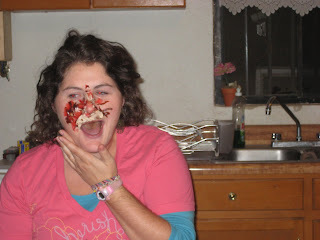 Mordida means to take a bite of the cake but it's code for get your face shoved in the cake. She looks good, huh? We got our first couple groups this weekend. A group of 12 from Big Bear came late late on Friday night. It's a group of high school students and leaders. They're actually from the church Neal went to in Big Bear. This morning, after breakfeast they built a bathroom for Iglesia Rosa de Saron (Pastor Reynerio). They put the whole thing up in just a few hours. Painted and all. After lunch (my first sandwich of my year here. many more to come. 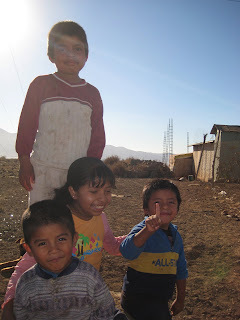 ), I took them to La Montana (The Mountain) to do a distribution of clothing, socks, and blankets to the men and women and candy, juice and animal crackers to the kids. It felt so good to be there. It was fun to start right where I left off. Leading groups on my own. For a very short period of time. 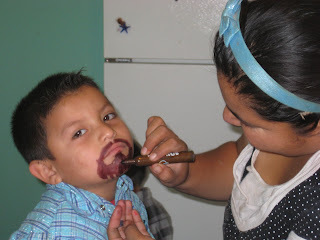 Before coming to Mexico I really never thought I had much leadership skill. God has shown me here and stretched me in ways I'm not comfortable to learn about myself and grow. The other group was from San Diego. They got into Maneadero (the city I technically work in) at 10:30 am and left at 4:00 pm. Just a quick day trip. 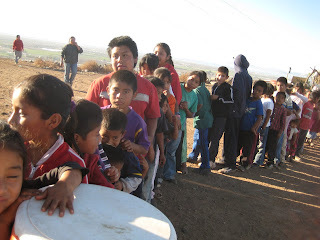 They did a distribution at Iglesia Rosa de Saron of clothes, bags of beans and rice, juice, candy, and toys. I only spent about 45 minutes with them but their church is a great support to the ministry here and it was good to have them. Here's a quickish breakdown of how a distribution works. Because there will be more to come. We try not to do a whole lot because we don't want the people to become dependent and cause more harm than good. We're very careful. First, we do songs. Worship songs for both kids and adults. Then, there are a couple testimonies of what God's done in the lives of people from the group. This group did a skit after that. Then, there's a short message about Christ. Finally, prayer. I'm reading my Spanish/English Bible and loving it! Thank you guys so much for praying for me. Please pray for unity in love among Rick and Tammie and us girls. Also pray for unity in the church here.